I don't often write about video games on this blog. I'd like to more often. It's a big hobby of mine. From now on when I do write about games, they will mostly be PC games that are cheap or free, because I am both cheap and free. 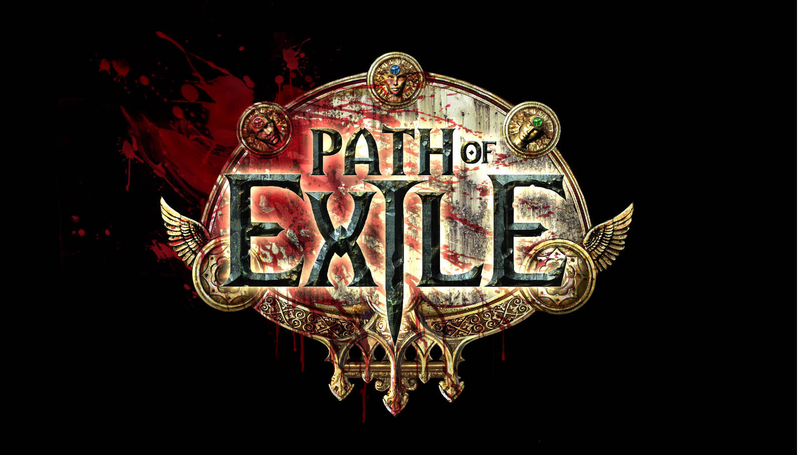 I'm going to start with a game that enters its open beta tomorrow: Path of Exile. Path of Exile is a free to play Action RPG (ARPG) developed by the New Zealand based Grinding Gear Games. If you're not familiar with an ARPG, think Diablo/Touchlight like isometric view, loot grinder. If you still don't know what I'm talking about, basically you run around, killing monsters to loot their smelly corpses of delicious treasure. Treasure which in turn aides you in the slaughter of more odorous monsters. I can't write about Path of Exile without at least acknowledging the 800 pound demon in the room that is Diablo III. In fairness, I'll only hover here briefly because Path of Exile is very much its own game. Diablo III and Path of Exile are polar opposites of one another. Blizzard (DIII's developer) took total control of your character, giving very little room for unique meaningful customization. Path of Exile on the other hand basically says "Here are a bunch of options, see what you come up with!" It is very possible to cripple a character in Path by making the wrong choices, which I believe is what Blizzard was trying to prevent in Diablo III. But it is also possible to make a character that plays just how you want it too. It is extraordinary the amount of options given. 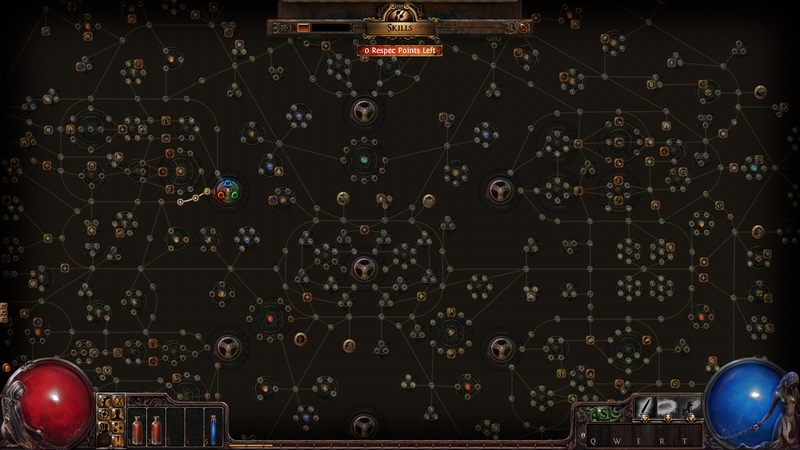 Below is a screen shot of the Passive Skill Tree in Path of Exile; try not to soil yourself. Don't look directly into it! Saying you can cripple a character in Path of Exile is selling the game a little short. Respecing is possible to a degree. There is no option to fully wipe the Passive Skill Tree (the only time this would happen is if the Devs amend the tree). You can however, earn respec points that allow you to respec one skill per point. In this fashion, you can make subtle changes to your character over time. You keep the feel of the same character that a full wipe just doesn't give. In this way, your digital caterpillar morphs into a unique murderous, fire breathing butterfly right before your eyes. This also encourages multiple characters as part of their free to pay system (more on that below). The amount of options available is mind blowing. The above mentioned Passive Skill Tree is just one part of it. Most armor has slots where Skill Gems can be placed. 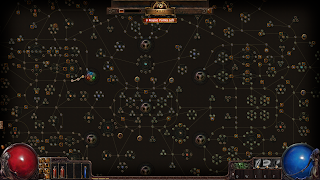 Skill Gems are the meat and potatoes of the combat system in Path of Exile. Character classes have no innate abilities beyond swinging the weapon they happen to pick up. What separates them are the stat(s) they are more proficient in and their stating location within the Passive Skill Tree. All active abilities (Fire balls, freezing strikes, and other basic fantasy fair) come as these Skill Gems that you can slot into your armor. They then become usable via your hot bar. These Skills can be further modified by Support Gems to crazy levels of awesome. I won’t get too into it here, but what if you could turn one fire ball into a three fire ball attack where each ball splits into two more fire balls on enemy contact? Fantastic? Yeah, I think so too. Beta is still beta however; so expect changes. As with any PC game these days, beta can mean many different things, but Grinding Gear Games has expressed that this beta is a real beta and major changes can be expected. I’d like to see the basic attack animations get some work myself. In a game about attacking, some variation in the way my small pixel character swings his/her tiny axe can make all the difference after eight hours. I also had some trouble clicking on smaller enemy monsters; nothing game breaking by any stretch of the imagination. Path of Exile is free to play and as of right now they mean to only sell cosmetic items. I had to calm my wife down just now; explaining to her cosmetic does not mean blush and eye shadow. Pets, character slots, stash tabs and adding a glow to your weapons and armor is what they have mentioned they will sell so far. No Pay to Win in that list at all. And while I commend the attempt to sell only cosmetic, I hope they can make it on those sales alone. I guess it is up to us, the gamer, to show how much we appreciate that model by supporting it. Path of Exile is free to play starting tomorrow (January 23)! You can create an account and pre-download it here. Come join me in the furious clicking on monsters until their necessary demise. Been playing Path of Exile? What do you think? Have a game in mind I should take a look at? Drop all these and what ever else your deranged mind has on it in the comments. The game is awesome. I might never log back in to Diablo 3.